Just played the demo on the PS3 and it looks amazing. HD visuals at 60fps and while it’s the same as the 360 Xbox version, I never did play it through so this looks a must buy for the PS3. Also tried Virtua Tennis demo but it was just as bad as the 360 version. Seeing as games are a bit thin on the ground (no Forza until June) I may pick up God of War 2 and also Pro Evo 6 on the PS2. God of War as it’s had great reviews and Pro Evo because after having a few games of the PS2 version it just feels better than the 360. It’s also only Â£17.99. Bargain. Speaking of bargains, Shop.To are selling PS3’s for Â£360 this weekend. Bit of a lazy weekend has been had although there’s a few things worth noting. Firstly, Casino Royale on Blu-Ray looks fantastic. If you’ve got a PS3 or a Blu-Ray player (all 10 of you in the UK) then this is a must own title. I’m enjoying the PS3 for movie playback so I’ll be picking up the remote which will get a lor more use than the 360 equivalent. Only annoyance is the remote is Bluetooth rather than Infra-red so I can’t program it into the Pronto. The new Bond has moved to the Bourne style of movies and low and behold if there isn’t a Bourne Ultimatum trailer available. Really looking forward to this and hope it meets the same high standard of the last two. More style can be found in the new trailer for Forza 2 (cheers Graham). Around one month to go for this must have 360 title that can’t fail to be good – can it? There hasn’t been a decent racing game on the 360 since PGR3 (Test Drive unlimited is a sims game rather than proper racing – harsh but true) so i can’t wait! I also decided that I would start hand crafting my own site style a good while ago but that stalled after a couple of days so I finally got round to putting some time into it this weekend. A new app from Panic may help (Coda) but it isn’t even revealed until tomorrow so that will have to wait. I’m finding it all a bit frustrating at the moment but I’m getting there…slowly. I’m guessing at my pace it will be a few weeks before I have something to show for my efforts. At the moment I’m aiming for white, minimal and little or no graphics or ajax. It’s time to get simple. Trialling .Mac at the moment and it’s great for keeping the two Macs and their apps in sync (calendars, address book, iGTD, Transmit and Yojimbo). The trial lasts for another couple of months before I have to hand over any cash but it’s likely thats another Â£70 to the Apple temple which is a tad annoying as .Mac doesn’t offer much disk space – this is an area Apple could address for not much money. It would be great if the Â£70 bought 40Gb of disk space to back up to and share. I have three Joost private beta invites to give away. I’ve used it a couple of times over the last week or so and while it’s a bit buggy it’s one to watch especially with the new content deals being signed. If your interested then leave a comment or drop me a mail. Note that Joost works on Windows and Macs. Well after a great week off it’s back to work tomorrow. Got lot’s of outdoor work done this week which was good. The weather has been great for April – yet more freaky weather! Also got chance to enjoy the PS3 a bit more, catch up on some movies and also some TV. Sky+ is great but I can never keep up with all that I record. That meant I had over 3 weeks of some series to watch but then I can at least skip the adverts. Also starting to get my act together with the two Macs and also thinking about off-site backup (paranoia is rife at the moment). I hadn’t really got the laptop and desktop working well together yet. The NAS drive I’ve got is good but gets noisy, so much so that I’ll be picking up an alternative or at least busting it open and replacing the fan with a larger, slower, quieter one. I’ve got the mail sorted by switching to IMAP so that all my e-mail (dating back to 98) is available on the server so from either Mac or on the web I can see it all. Next is the sharing of data between calendars, address books and a few applications I use. I’ve got a couple of options. Sign up to .Mac which is Â£70 a year for syncing and access to a 1 Gig iDisk. There’s other benefits but none that I would use. Alternatively I could sign up to something like Dreamhost and use it for the sole purpose of remote backup and synchronisation, making use of Transmit to keep folders in sync. Dreamhost would give me 160Gig with Webdav support for Â£60 a year. Decisions, decisions. Anyway, back to watching Lost. The last three episodes have been great! After posting on the PS3 hardware and software it’s time to look at the games. Certainly the most important part of any console release is the quality of the games. The most touted games on release are Motorstorm and Resistance:Fall of Man. How do they shape up? 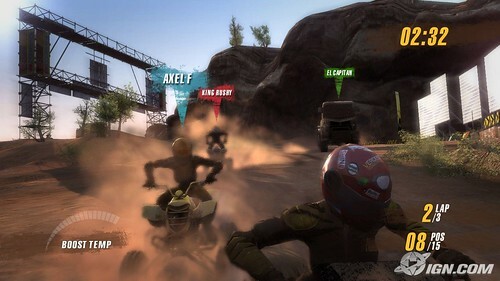 Being the flagship PS3 title, Motorstorm has a lot to live up to. The game had so much pre-release hype and false starts (rendered E3 demo’s etc) and then a release in Japan minus the online component – how would it fair? Motorstorm is in some ways the perfect release title. Loud music, high impact visuals and massive, at times bewildering arena’s to race in. You can’t fail to be impressed in that first half hour. For mates popping round and demo pods it’s a great game. After that half hour though is pretty disappointing. You realise that there isn’t much variety to the music and it soon repeats. You also realise you can’t change it to any of your own music. The graphics still impress but there’s a sameness about everything. Away from the wow stuff though and it’s just repetition. Offline is just select a bike, truck etc and race on one of the eight tracks. Yep – no longer arena’s. There isn’t that many routes and there’s usually the one route for your particular vehicle. The load times are also very long – some of the worst I’ve seen in recent years. It gets very annoying that selecting a vehicle takes such a long time, never mind the actual track loading. Online is at times impressive (lag free 12 player racing) but I reckon at least a third of my online games have not started, crashed out or been buggy in such a way to ruin the race. One of the other shortfalls is the lack of interaction. For all you know your racing against AI with the PS3 generating random gamertags to display – it is totally lacking in speech and atmosphere. While it does support speech hardly anyone has a headset and the game will also switch off speech to protect lag. Unlike offline, most online games also have catch up disabled. Quite a lot of the games I’ve raced sees one person break away from the pack and he will ultimately win the race as the pack fight each other while he sails off into the distance. Like the real F1 most online races are decided within the first few corners. Ultimately if you get a PS3 you should get Motorstorm as it does initially impress – just don’t expect that feeling to last.